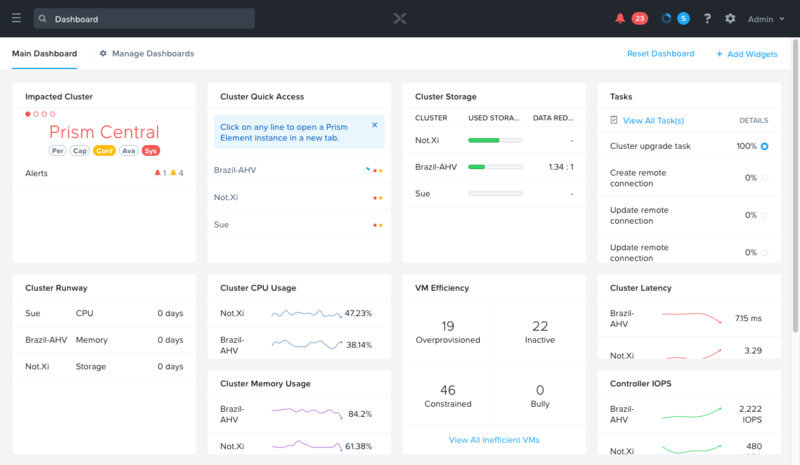 Prism Central is a multi-cluster management tool that is used to manage all of your Nutanix infrastructure. When it was first introduced 4 years ago it had a modest list of features and 5 managed entity types (e.g. VMs). Since then we’ve introduced over 20 new entity types and numerous features such as Planning, DR, etc. 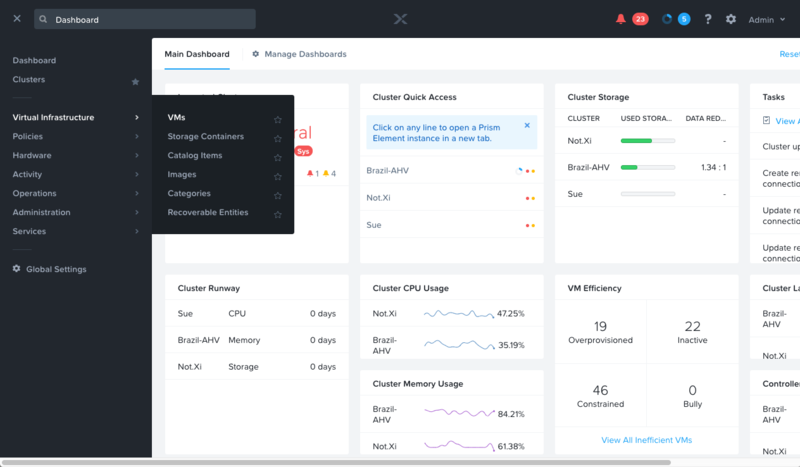 Additionally, customers are increasingly managing large amounts of hosts, clusters and VMs from within a single Prism Central. This infusion of capabilities and increase in infrastructure footprint has led to the Prism Central interface reaching the scale limits of its original design. This caused us to rethink the direction of the Prism Central experience. Search is a powerful tool to deal with scale. It facilitates a more intent based interaction with the system that flattens hierarchy and enables efficiency. For example, spotlight search on macOS enables, among other things, users to type in the name of a setting they want to modify (e.g. Displays) and jump directly there as opposed to navigating via a series of clicks and menus. While search is very powerful, there were several things to consider as we designed the future direction of Prism Central. Our research indicated that data center admins are mixed in terms of those who naturally gravitate towards using search capabilities and those who gravitate toward click-based mechanisms. Also, search capabilities can be somewhat challenging to discover and learn since there is some underlying syntax or structure that won’t be immediately apparent to the user. 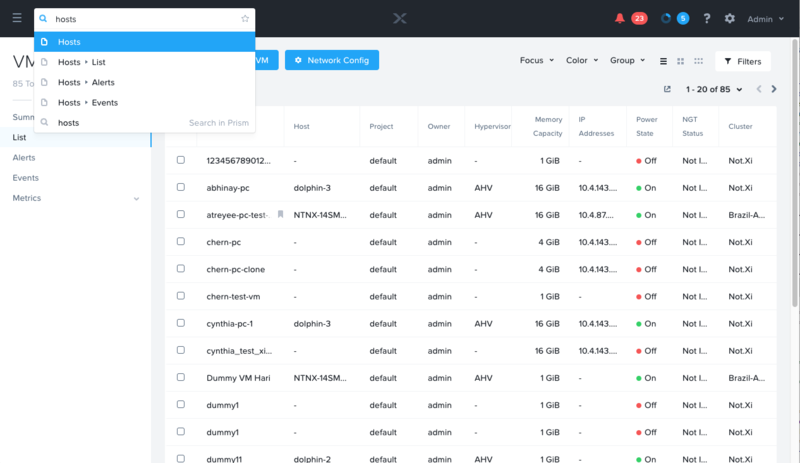 Provide powerful search capabilities to deal with scale. Retain intuitive click-based interaction to aid in discovery and learning. Tightly integrate search and click-based interaction so users can easily change between them and use whichever mechanism is more appropriate for their current workflow. 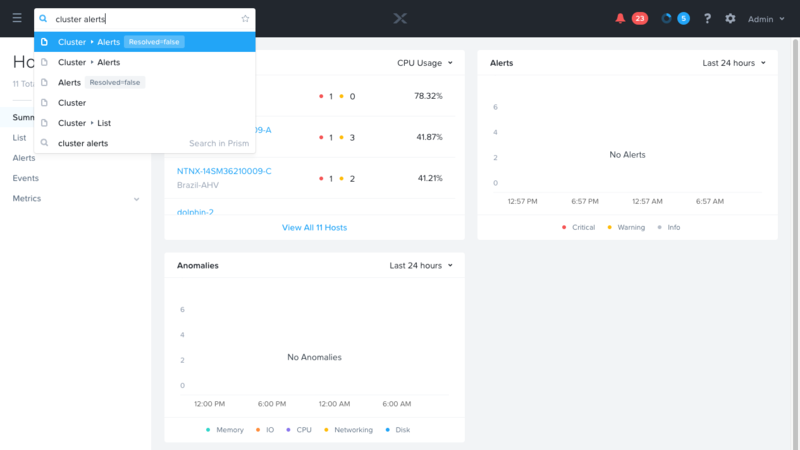 Support customization so users can quickly get the information they care most about. This section goes through a tour of the new interface and its capabilities. The main landing page of Prism Central is still the familiar dashboard. Notice that the left portion of the header has been cleaned up to show a search bar and navigational menu. 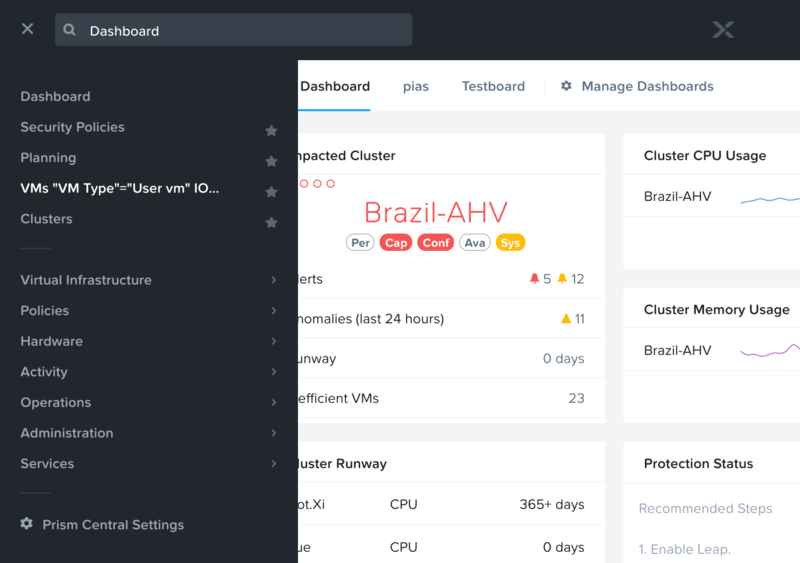 The global navigation can be used to navigate to a page such as VMs. 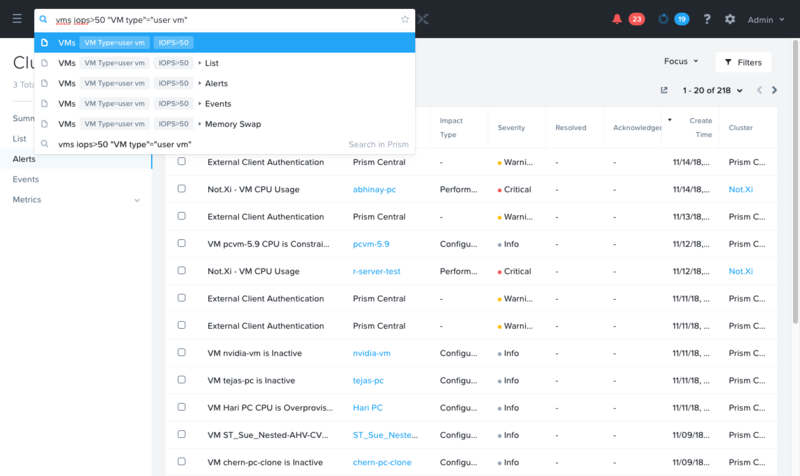 The VM summary page shows a variety of information. Notice that the search bar says ‘VMs’ to denote this page can also be accessed via search. To find hosts in the system, I could go back to the global navigation menu, or just use the search. 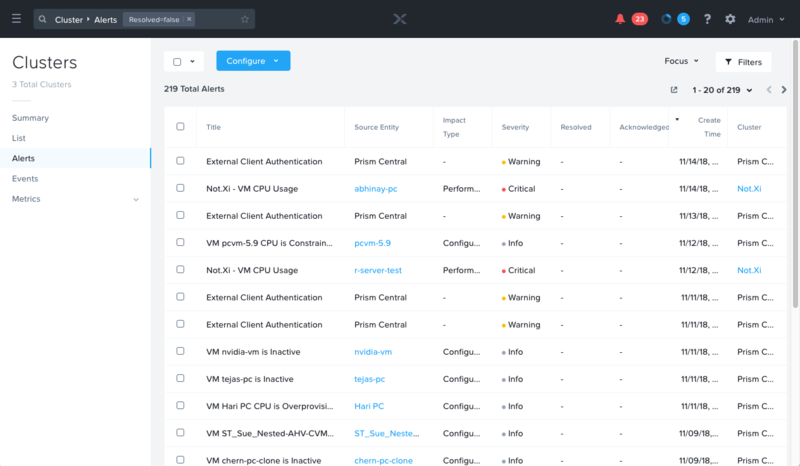 The Hosts summary page is similar to the VMs Summary page. If I want to view alerts for cluster entities, I can search for ‘cluster alerts’. 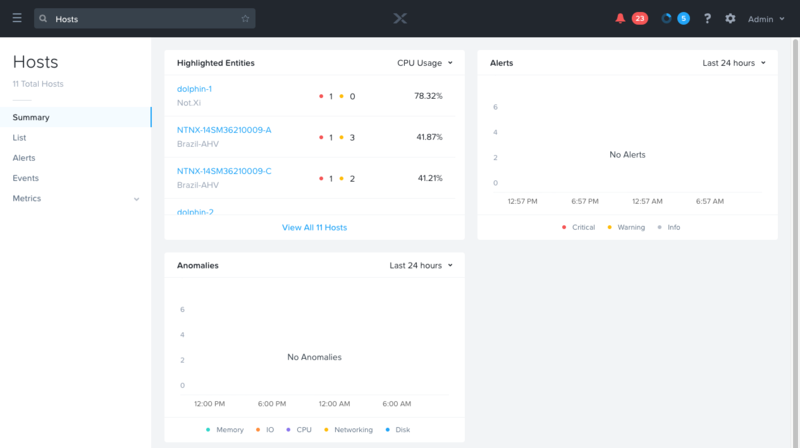 The first autocomplete item will take me to the Alerts view for the Clusters page. This is where I am taken when clicking the first autocomplete item in the previous screenshot. Notice the global search bar is reflecting that a default filter ‘Resolved=false’ has been applied. This gives the user an indication they can type filters into the search bar. To add additional filters, user can type them into the global search, or click the filter button on the right to access the traditional filter UI. More sophisticated queries with filters can also be entered. 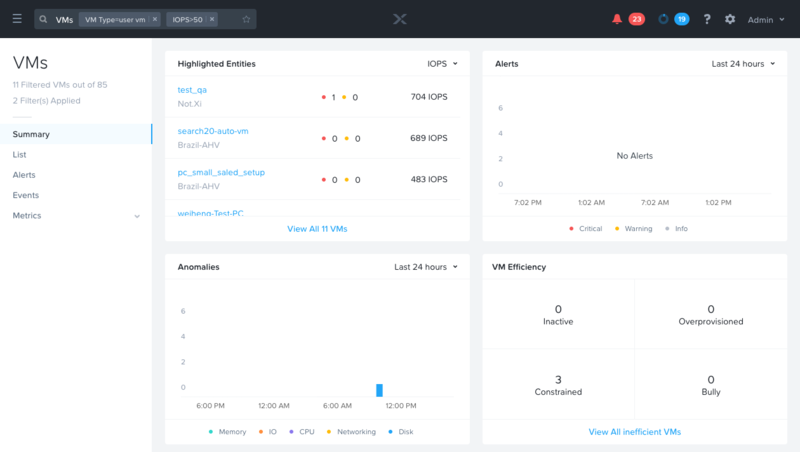 For example, if you wanted to find all VMs with iops>50 that are user VMs, you could type out the query pictured below. Autocomplete recognizes the filters and uses special formatting to show that it has understood them. 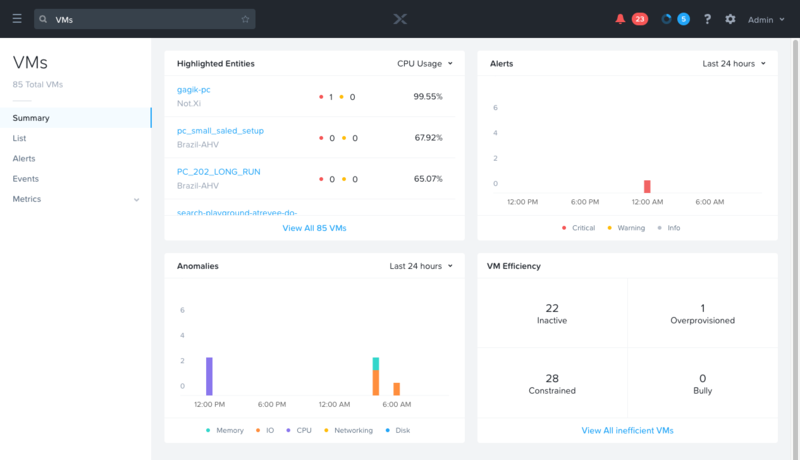 Examples of other interesting queries that can be entered are ‘AHV powered on vms’ or ‘perf critical alerts’. You can also find any entity in the system (e.g. VM, host, security policy) by simply searching by name, or IP address where relevant. This is the VMs page with the filters from the previous query applied. Now only VMs that meet the specified filter criteria are reflected on the page. If this is a frequently used view, it can be bookmarked for quick access in the future by using the star in the search box. When reopening the global navigation menu, bookmarked items appear at the top. This ensures quick and easy access to the pages most frequently visited. As illustrated in the previous example, these bookmarks can have any variety of filters applied. So for example, you can have several bookmarks for the VMs page with different filter criteria applied, which would allow you to easily view different segments of VMs (e.g. Dev, Test, Production). The Categories feature is supported by search and can be leveraged to create such views. With the new search you can easily find and jump directly to the page that corresponds to a setting you want to modify, for example language settings. Search isn’t required to access settings, you can still go to the global navigation, click ‘Prism Central Settings’ and browse through the full list. As modern web applications, such as Prism Central, become richer and support more functionality, information architectures and navigational mechanisms become more complex. Search is commonly viewed as a way to navigate through vast amounts of content, but learning search capabilities can be difficult and some users are more inclined to click then search. By merging search and navigation into one seamless construct, click based navigation is retained, while a more efficient search based way to access content is also available. With this new approach, conventional click based interaction with the system allows users to see their actions reflect through search and thus learn its capabilities. In that way, click based navigation not only provides a familiar experience for those who aren’t inclined to search, but it also provides a natural ramp for users of all types to understand, learn, and adopt search behavior if they so choose. Thanks to all the users who helped try out and give feedback on different prototypes of this new experience. We look forward to additional feedback now that it has shipped in 5.10. For more detailed information about the new search capabilities, click on ‘Learn about search’ in the global question mark icon in version 5.10 or later of Prism Central, or simply search for ‘Search Guidelines’.